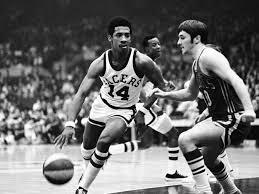 I happen to believe Freddie Lewis should have his jersey number retired by the Pacers. I happen to believe it should be obvious. So do many others who saw him play. This story attempts to make the case. Here are career summaries of four former professional basketball players. Find the one that doesn’t fit. Played on three championship teams, and was voted MVP of the finals once … First-team all-league once, second-team all-league twice … Four-time All-Star … Scored 10,498 career points.